When driving at BIL, Learn how to receive these trip requests and get in on the action. The waiting area is located on Overlook Drive (see map below). 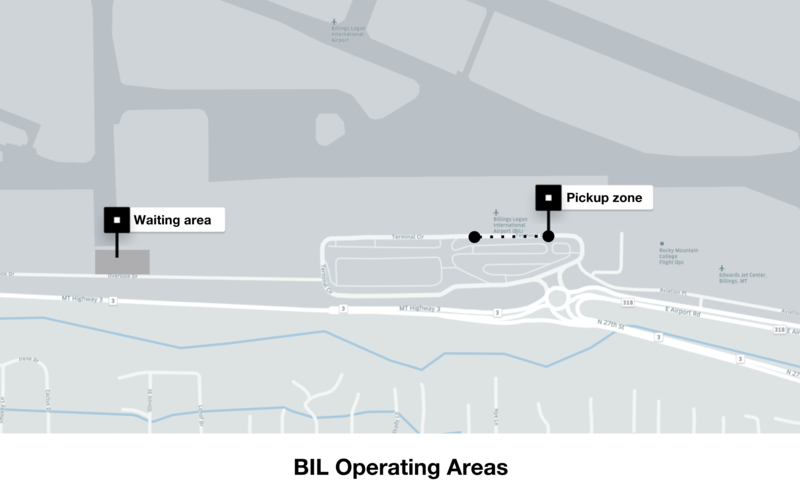 Once you accept a trip request, the pickup location at the airport is located curbside outside of Door 3 or Door 4 of the airport terminal (see map below). Based on the operating agreement with the airport, riders can be dropped off at curbside outside of Door 1 or Door 2 of the airport terminal. If you’d like to receive a trip request afterward, you’ll need to keep the Uber driver app on to maintain your place in the FIFO queue. Checking the arrivals schedule at Billings Logan International Airport can help you maximize your earnings with information about when flights will be landing at the airport and when it will be busiest. See BIL ARRIVALS SCHEDULE.